The Master in Design for Emergent Futures (MDEF) is organised by the Institute for Advanced Architecture of Catalonia and ELISAVA Barcelona School of Design and Engineering, in collaboration with the Fab Academy. The Master is a nine-month experience (currently, the second year is being developed) for students who want to expand their focus interests and acquire the skills to turn protests into prototypes, ideas into actions, and who are engaged in the mission of transforming the current status of affairs in society. 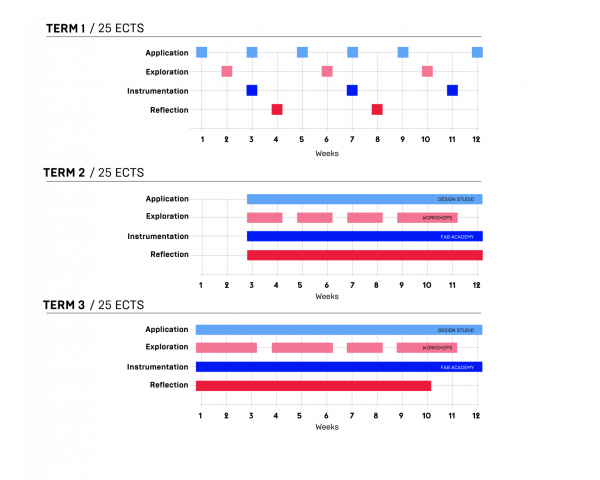 The programme is structured in four critical steps: Exploration, Instrumentation, Reflection and Application. Through these four steps, the master aims to provide strategic vision and tools for designers, sociologists, economists and computer scientists, to become agents of change in multiple professional environments. The programme focus is in the design of interventions in the form of products, platforms and deployments that aim to produce new emergent futures, by previously analysing the current challenges in society and industry. Students will be encouraged to work at multiple scales (from bits to geography) in order to design and test interventions in the real world. The theoretical and practical content in this programme proposes an exploratory journey to comprehend and critique the role of disruptive technologies –digital fabrication, the blockchain, synthetic biology, Artificial Intelligence, among others– in the transformation of the established order. At the same time, during the MDEF students will develop a hybrid profile that mixes various sets of skills (technical and human) that will be applied in the implementation of projects. Graduates of this masters will have a wide and informed vision of the impact of technology in businesses, education, society and culture, and will be prototyping and testing some of these technologies in the studios (research, design and development). During the master, a series of potential collaborations with industry, government and other professional sectors will be encouraged in order to develop more impactful projects. 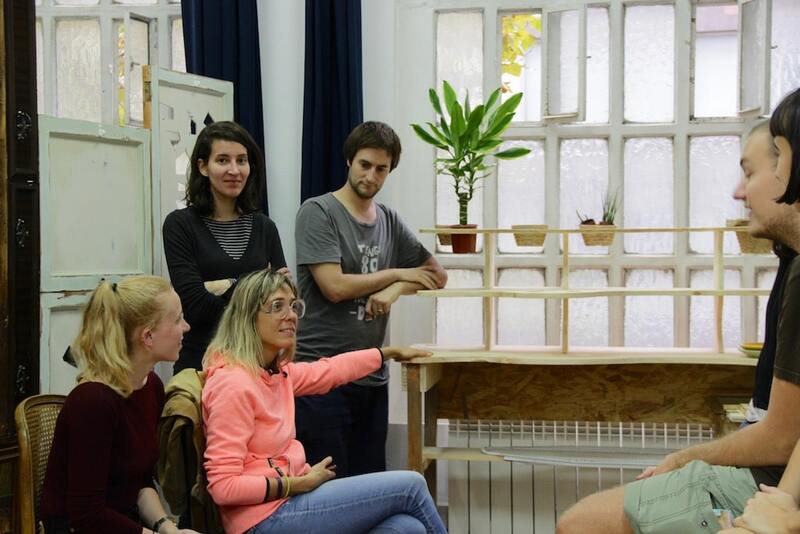 IAAC and Fab Lab Barcelona have collaborated with the following organisations: Nike, IKEA, Airbus, Festool, Ajuntament de Barcelona, UN-Habitat and others. ELISAVA has collaborated with companies like Agbar, Cisco Systems, Hewlett Packard, DUPONT, SUEZ, SEAT, Yamaha, among others. Admission Bachelor or higher degree in Industrial Design, Product Design, Urban Design, Graphic Design, Interaction Design, Computer Science, Engineering (Mechanical, Chemical, Product, Material), Sociology, Anthropology, Economy, and other related professions. We live in a moment of rapid change where new economic, environmental and social paradigms are challenging the status quo of the 150 years old industrial society. The biosphere, financial markets, family structures, business models in product development, and society, in general, are being challenged in one of the most important transition periods of human history. While the industrial revolution produced innumerable benefits to society, we are now confronted with a plethora of complex and interconnected problems that challenge our productive model: climate change, social disenfranchisement, and the centralisation of wealth and power. Cedric Price once asked: Technology is the answer, but what was the question? This is the moment for us to formulate the new questions for technology to redefine its role in society, to create promising and viable emergent futures for humanity to thrive, and not just survive. The ongoing transformations in the industry, under a new production paradigm supported by advanced manufacturing, new forms of synthetic intelligence, new material science or connected systems, are opening endless opportunities to re-calibrate the negative effects of the human centred activities on planet earth. Some of these emergent technologies (digital fabrication, synthetic biology, artificial intelligence, blockchain, to name a few) are already disrupting the established mechanisms under which our productive model operates, and are producing massive cultural transformations in society. If the machine era aimed to shape the human habitat by creating interfaces with natural resources through science and technology, the ubiquitous nature of digital technologies will demand articulation and rapid synchronization of systems at different scales, both biological and synthetic. At the same time, the emergence of such new tools and technologies are demanding us to create different outputs from the ones we already know and to design possible futures for life (human and non-human) in this planet. The complexity of the current transition period usually leads to the creation of wicked problems, or problems without solution, which need to be addressed from a multidisciplinary and collaborative perspective. Our approach is not to look for moon shots, instead, we are proposing small-scale interventions to approach large-scale challenges, in order to dissolve wicked problems instead to solve them with single solutions. This is why we are establishing a strong collaboration between one of the world’s leading institutions in technology and experimentation like IAAC, with one of the best Design and Engineering schools in the world, together with the larger distributed educational programme and one of the emergent disruptive companies of Barcelona and Europe. The Master in Design for Emergent Futures embeds its philosophy and methodology in its own structure and mechanisms of function, by engaging students in a personal and collective journey towards the creation of emergent futures, the path to make them happen, and to acquire the skills to envision, understand and test them in the real world. 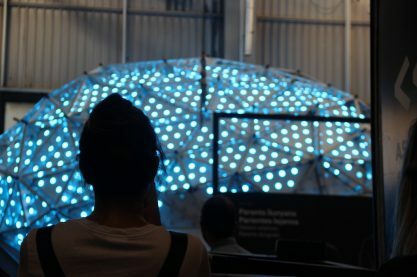 This is why we are establishing a unique collaboration between the Institute for Advanced Architecture of Catalonia and ELISAVA School of Design and Engineering, in collaboration with the Fab Academy, as well as other partners such as Space10, Kickstarter, Seeed Studio, among others to be announced soon. The Master in Design for Emergent Futures (MDEF) is organised in three terms (Oct-Dec, Jan-Mar, Apr-Jun), each including Design Studios, a Research Trip, complementary Seminars and related events. The Design Studios are the main part of the programme: they focus on real-world experimentation and socio-technical development. During the year, students will be developing technical, aesthetic and conceptual skills by working on real-life scenarios. Seminar sessions are designed to delve into specific domains of knowledge and are delivered by relevant experts, including both practitioners and scholars. Throughout the academic year, international experts in the field of design and emergent technologies will be contributing to the programme as guest lecturers. In this master, we will not teach students a methodology, neither a set of golden rules to be applied in given assignments. Instead, we introduce the MDEF as a journey and exploration on how projects can be manifestos to introduce new outputs. Exploration: We will expose the students to a set of technologies that have the capacity to disrupt our present understanding of society, industry and the economy. Reflection: We will support the students in developing their identity and a set of skills, knowledge and attitude as designers of possible futures. Instrumentation: We will provide a set of skills and tools that will help to translate ideas into prototypes, and prototypes into products, which can be tested and iterated throughout the design process. Application: We will encourage students to create a culture of making, where prototyping acts as a generator of knowledge, and interventions become message carriers of a future that is about to arrive. 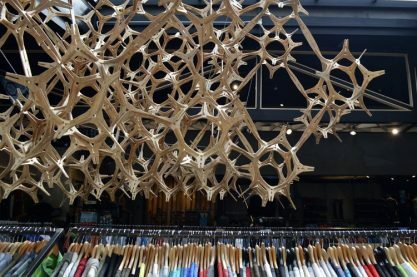 The Master in Design for Emergent Futures is connected with the Exploring Emergent Futures platform at the Royal College of Art, London, which has been developed by James Tooze and Tomas Diez from 2015. And is now led by James and Elizabeth Corbin. September – December: Introductory courses and philosophical/ theoretical background. APPLICATION – Research studio. Establishing an area of interest, analysis and research. Definition of topic and direction of the final project. 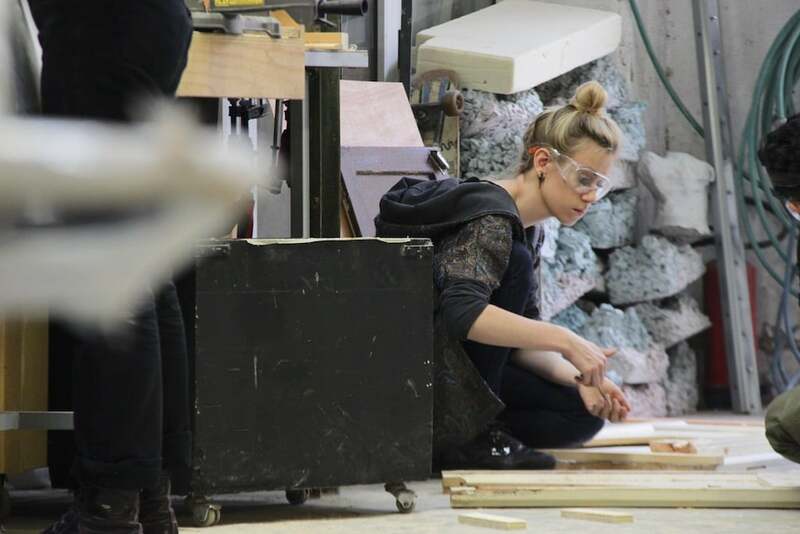 January – March: Design for Emergent Futures Studio 2: Making possible future speculations. APPLICATION – Design Studio: Project-oriented. Understand, develop and propose. Applied research and instrumentations. REFLECTION – Design approaches: Emergent Design trends, create your design identity and vision. INSTRUMENTATION – Fab Academy (how to make almost anything): principles and practices, project management, computer-aided design, computer-controlled cutting, electronics production, 3D scanning and printing, electronics design, computer-controlled machining, embedded programming, mechanical design, output devices, machine design. EXPLORATION – Emergent technologies: How Artificial Intelligence, Synthetic Biology, Digital Fabrication, Robotics are changing everything? 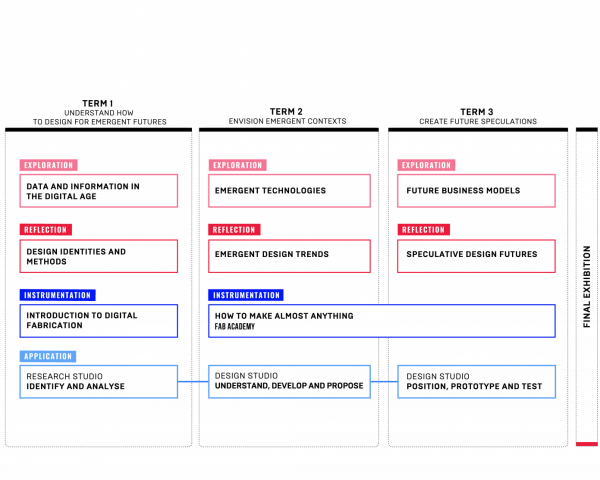 April – June: Design for Emergent Futures Studio 3: Making possible future speculations. 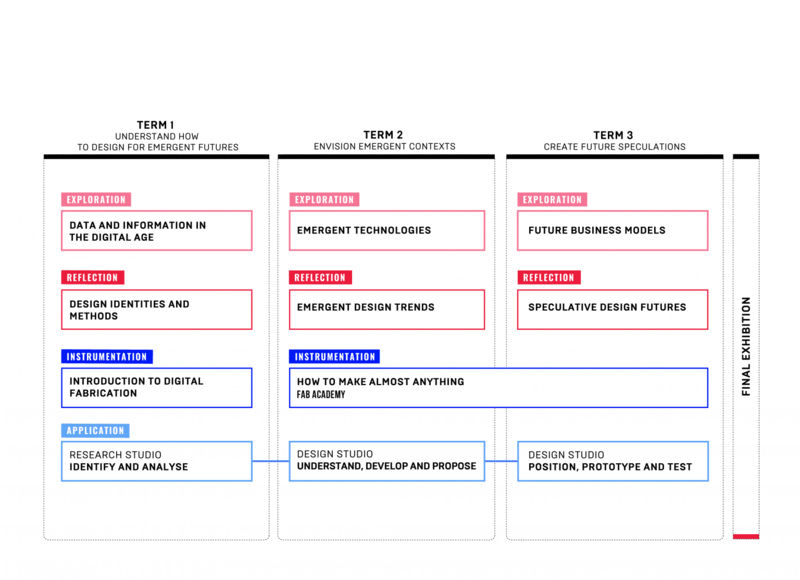 REFLECTION – Materialising possible speculations: Roles of prototyping, from demos to research products. 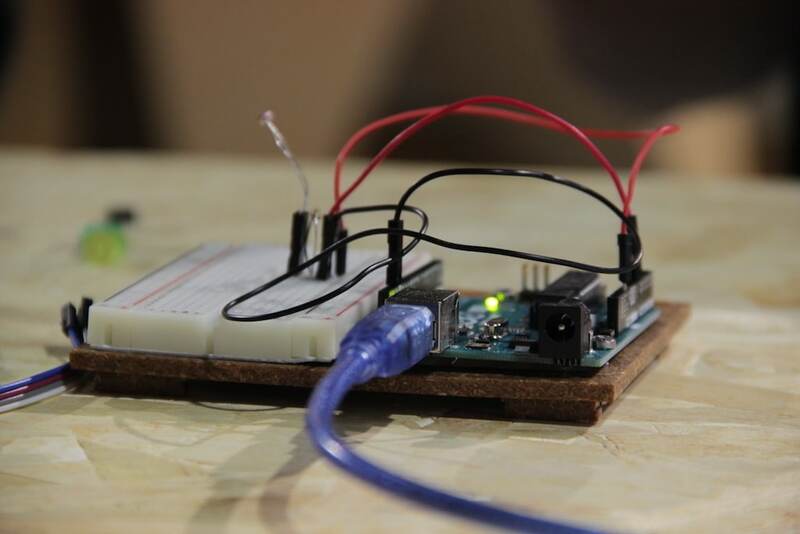 INSTRUMENTATION – Fab Academy (how to make almost anything): moulding and casting, input devices, composites, networking and communications, interface and application programming, applications and implications, invention, intellectual property, and income. EXPLORATION – Future business models: Crowdfunding and crowdsourcing, open source business models, cryptocurrencies and cryptomarkets. Research, development and implementation of projects during one year. Projects are aimed to have multiple exits, they could be considered as an incubation (business), research (education) or development (social) process to increase the impact of interventions in the real world. The MDEF programme is recommended for designers, sociologists, computer scientists, economists, anthropologists, technology entrepreneurs and changemakers who are looking for a hybrid career path to conceive and produce impactful ideas to transform the world. 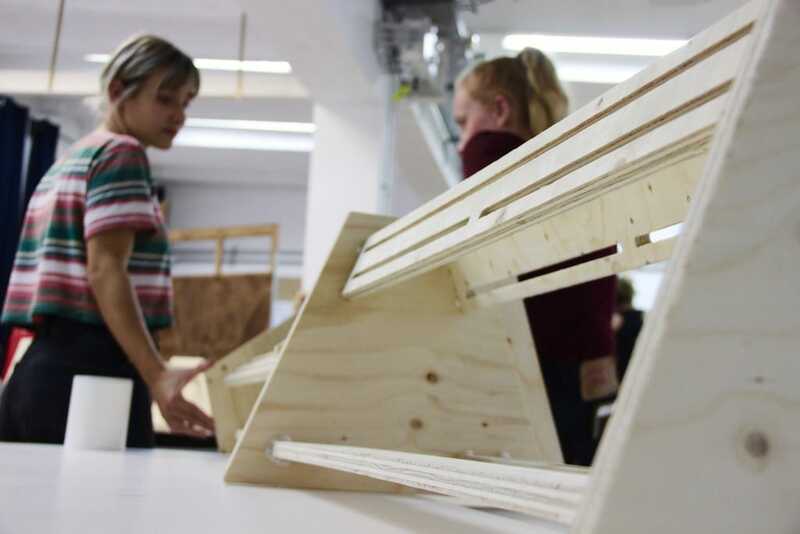 This Master has a high component of hands-on learning and project-based learning where students will be requested to transform big ideas into design strategies, prototypes and interventions to be tested in the real world, focused on Barcelona but connected globally with other cities. Candidates for the Master in Design for Emergent Futures are professionals coming from Industrial Design, Product Design, Urban Design, Graphic Design, Interaction Design, Computer Science, Engineering (Mechanical, Chemical, Product, Material), Sociology, Anthropology, Economy, and other related professions. Upon successful completion of the master, the students will join the IAAC and ELISAVA Alumni Communities. IAAC Alumni Community is an active and dynamic network of visionary professionals spread around the world, promoting principles and applications of digital fabrication, design and architecture, exploring new academic and research initiatives, leading award-winning practices or working for internationally acclaimed firms and institutions. ELISAVA alumni have the mission of promoting the constant personal and professional development of ELISAVA former students. For this reason, it is built as a participative space open to diversity, and orientated to motivate leadership, cooperation, and entrepreneurship through strategic values such as design, technology, with the purpose of giving answers to the needs of nowadays society. At the Master in Design for Emergent Futures (MDEF) programme we want to make possible new realities by intersecting technology convergence with global challenges. In this sense, we are aiming to build narratives of the future from a different perspective that we are used to. Instead of creating fixed scenarios on how the future will look like, we want to know how we are going to make it there, and which will be the main challenges we will face. We are not looking for a description of the 2019 Los Angeles depicted in the first Blade Runner movie, we want you to tell us about the path to get to possible futures in 2050, what we might find ahead, closer to Kavafis’ description of the trip to Ithaca. We want you to write a science fiction story (1000 words maximum) illustrated with one image about the future of anything (food, work, mobility, humanity, health, manufacturing, entertainment, tourism… anything) in the year 2050. Imagine you are already 31 years ahead of 2019, what are you doing? Which are society’s problems in 2050? How is everyday life? How we got there? When was the key turning point? And How? Why? These are some of the questions that can help you to articulate your narrative, always with the perspective of how you imagine you can play a role in order to make the futures, you are presenting to us, possible. To apply the candidates should fill up the Scholarship Application Form at this link and upload their projects in there. The Institute for Advanced Architecture of Catalonia will release the name of the winners on its official website in March 2019. The Institute for Advanced Architecture of Catalonia (IAAC) is a centre for research, education, production and outreach, with the mission of envisioning the future habitat of our society and building it in the present. 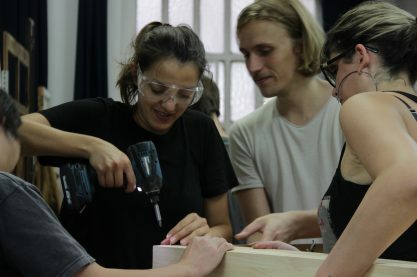 IAAC follows the digital revolution at all scales (from bits to geography, from micro-controllers to cities, from materials to the territory) to expand the boundaries of architecture and design and meet the challenges faced by humanity. IAAC is an experimental and experiential centre where one learns by doing, through a test methodology that promotes real solutions. IAAC is open, independent and radical; inspired by the values of Barcelona, the capital of architecture and design, where urbanism was invented and where a local high quality and innovation-oriented research is connected to an international network of excellence in technology, design and society fields. ELISAVA Barcelona School of Design and Engineering promotes education, knowledge, research, development and innovation in the fields of design and engineering in industrial design while training the students to encompass professional challenges in an international context, promoting the relationship among our community and businesses, institutions and society. ELISAVA delves into practical work and stimulates critical reflection among its students so they finish their studies with the ability to answer the needs of an evolving society. Inspiring, multidisciplinary, knowledge-generator and trendsetter, our centre trains professionals who will challenge the future. Fab Academy is a distributed educational programme that offers a unique and collaborative learning experience. 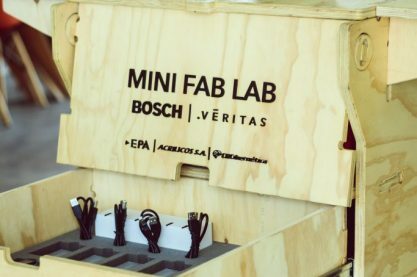 Each participating Fab Lab provides the space, inventory and machines for students to pursue their own project goals while interacting in a global classroom where they can share their progress, ideas, problems and solutions. Fab Academy teaches a “learning to learn” approach, where students share methods and best practices in an open-source and collaborative environment. During this 5-month programme, students are supported by local instructors who guide students in the various assignments and topics covered each week. Every week is introduced via an interactive video stream guided by Neil Gershenfeld, Director of the MIT’s CBA. 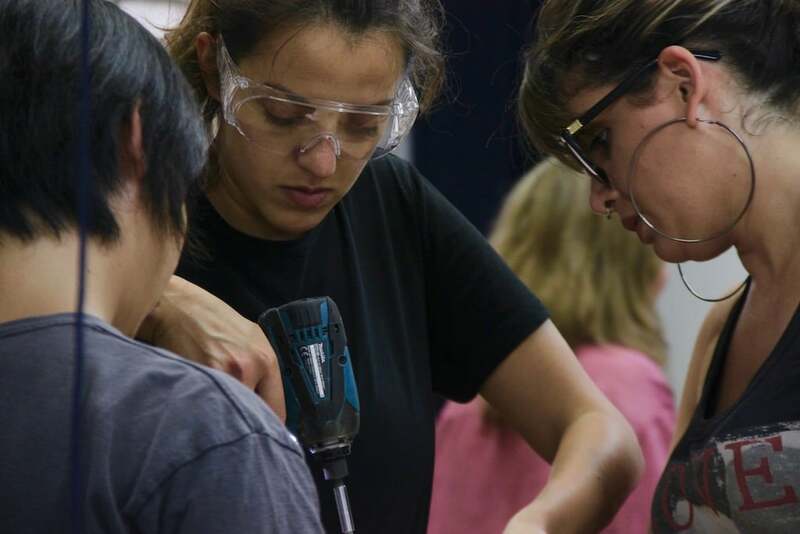 At its core, Fab Academy empowers students to learn by doing, inspires them to make stuff locally and to become active participants in sustainable cities and communities.  Ideas for Change is a consulting and research company that works in the fields of impact innovation, business strategy and user design. We have pioneered research on open strategies and exponential growth and consulted for big, medium and small size clients looking to transition to more contributive and open strategies while sustaining competitiveness and a strong position in their markets. Our in-house innovation projects have been awarded and also adapted to drive innovation worldwide. The Academany – the Academy of (almost) Anything. With the increasing availability and ease of use of digital tools and systems, both in the world of fabrication, biology and design, the possibility to solve problems locally is becoming greater every day. 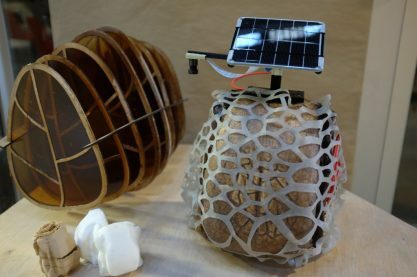 But it is often overlooked that the tools and means to build objects destined for everyday use or to safely use synthetic biology to locally produce energy or medicine, is not at all easy or trivial. The Academany is a new global educational structure offering high-level education all over the globe, at connected sites offering the same infrastructure to all students. Seed Studio is a platform for global creative technologists to turn ideas into products, by providing open technology and agile manufacturing. Seeed’s IoT Hardware Innovation Lab (x.factory), situated in the heart of Shenzhen, China, serves as an IoT hardware lab for developers with prototyping tools and equipment, as well as a community of tech partners. The x.factory is operated by Chaihuo Maker Space, Shenzhen’s first and leading maker space since 2011, and it is the headquarter of Seeed Studio. It’s an “open factory” with production-level equipment for in-house prototyping and small-batch production services, as well as co-working spaces to make projects. The x.factory helps members to connect to Shenzhen’s vast resources in supply chain, as well as industry and market opportunities in China. Kickstarter is a funding platform for creative projects. Everything from films, games, and music to art, design, and technology. Kickstarter is full of ambitious, innovative, and imaginative ideas that are brought to life through the direct support of others. Kickstarter helps artists, musicians, filmmakers, designers, and other creators find the resources and support they need to make their ideas a reality. To date, tens of thousands of creative projects — big and small — have come to life with the support of the Kickstarter community. Kickstarter is an enormous global community built around creativity and creative projects. Over 10 million people, from every continent on earth, have backed a Kickstarter project. Space 10 in Copenhagen is a research hub and exhibition space initiated by Swedish furniture company IKEA. The innovation lab explores how different approaches and trends might influence home design and the future of living. Focused on sustainability and responsible business models the hub has been operating since 2015. SPACE10 integrates four different labs that conduct research on important topics that might change the way people live in the future: “The Farm”, “Do you speak human?”, “Possible Cities” and “Build with Spaces”.